Just over 12 months since I tore my Anterior Cruciate Ligament and Lateral Meniscus, broke my leg, and severely damaged virtually every other structure in my right knee, I’m thrilled to report that I’m back to roughly 100%. It’s a good thing too, as throttle lust had been getting the better of me of late. I hadn’t ridden a single mile of dirt since last fall’s Happy Trails Lolo Motorway Rally in Kamiah—and even that was a weak showing with only 40-50% stability in my right knee following surgery. My orthopedic surgeon strongly suggested I stay away from the bike altogether until spring, but what does he know? Throwing caution to the wind, three perfect September days in north-central Idaho riding two-track (able-bodied participants at the rally found their way into some way cooler single track rides) reignited a spark that had faded alongside my injury. I left Kamiah, for lack of better words—stoked. 2014 would present the perfect opportunity to relearn how to appreciate what I had long taken for granted—exploration, solitude, adrenaline, adventure—all the things that make a dual sport motorcycle the preferred method of transport here in the Gem State. So now that spring has begun to fade into summer and the snow is gone from the immediate hillsides around my home in Boise, I scheduled the first pair of rides to see how far and how high I could get into Idaho’s back country. This time of year, the only limitation is snowpack, as the weather is generally pleasant and the landscapes are richly adorned with green undertones and myriad vibrant wildflower accents. First up, Memorial Day weekend—Rocky Canyon to 10 Mile Creek to Garden Valley to Round Valley to Boise. This little three day, 322 mile jaunt was mostly paved, but presented myself and my riding companion (high school buddy Nolan Smith, and his BMW 800GS) with an opportunity to see how passable Central Idaho’s ridges were. We fully expected to hit snow—the question remained just how much, and whether we could ride around or through it. Recent rains made for a swift and tacky run over Rocky Canyon to Robie Creek. Burning daylight, we made quick work over Mores Creek Summit on pavement before taking the 10 Mile Creek access bridge over the South Fork of the Payette River. We met a group of friends at a secluded spot along the river, and unwound before the rollicking flames of a massive bonfire. The next morning, we burned tarmac to Crouch for breakfast at Wild Bills Café. Leafing through some old Forest Service paper maps for alternate routes to Round Valley—in the event that we were bamboozled by snow—we found a less-traveled lower elevation surrogate route that would come in handy a few hours later. We cruised serenely up the road abutting the Middle Fork of the Payette to the confluence with Silver Creek and headed west up Road 670. We didn’t see a single soul after cresting the ridge at the 693 Junction. There was quite a bit of snow on the side of the road, and you could tell by the uninterrupted condition of the pine needles under tire that few if any travelers had gone this far in 2014. We reached the junction that sends you either west to Bacon Creek or northwest to Landmark, and decided to take the lower elevation route due to the amount of snow we had already seen. Not 300 yards down the south facing slope and we hit our first snowbank. I carefully aligned my front wheel with the terrain’s flattest trajectory and gave the KLR some gas. I slipped and slid through without issue. Nolan navigated my tire groove without issue. A few hundred yards later, we came across what became affectionately known as “the big one.” This 60-foot long 2 to 3 foot deep snowbank laid between two steep drainage whoops would mean trouble in the event that we had to turn back. Getting the bikes back up this sucker would be impossible. I again lined up my front end and pulled the trigger. This time, I buried the KLR up to the boxes within 10 feet of entry. Frustrated, I hopped off the bike and started walking downhill to see what the upcoming half mile had in store for us. It appeared to clear out, so Nolan and I carefully pushed and feathered both bikes to the bottom of the snow bank. We were the first tracks through in 2014. We both breathed a sigh of relief when we caught our first glimpse of Round Valley’s prairie through the trees above Bacon Creek. We were in Cascade less than 30 minutes later. We spent the next day-and-a-half riding lower elevation roads and tracks and unwinding by the reservoir with friends. I debated heading over High Valley on my way back to Boise, but traffic on Highway 55 was surprisingly modest for the holiday weekend, and I had to get a head start on the upcoming short work week. The following weekend, we commissioned the assistance of my room mate Matt (and his BMW 650 Dakar) for a run over to Cambridge, Brownlee, Hells Canyon, the Kleinschmidt Grade, Cuprum, Huckleberry, Bear, Council and back to Boise. This 360-mile mini-tour took us through some incredible scenery, dramatic elevation changes, and even more snow. Leaving Boise at 6pm on a Friday, we knew we would be burning daylight by the time we hit Cambridge. We made quick work of Highway 71 down to the Brownlee campground just before sundown. A crisp evening between two rushing creeks was quickly remedied as we dropped the next morning into the low elevation heat of Hells Canyon. A quick run over the dam and we were on our way to the epically steep Klienschmidt Grade—5,000 feet from canyon floor to canyon rim in just a few short miles. The panoramas were incredible, as we transitioned from desert back to high alpine forest. We putted along the Cuprum-Council dirt road without seeing another moving vehicle the entire way. We elected to take the long route to Huckleberry campground along Little Bear Creek—making note of a potential afternoon ride to Black Lake after we set up camp. After we were situated at Huckleberry, we detached our Happy Trails boxes and made a run for Black Lake. Not 4 miles in and we ran into a mud slick that promptly turned into a deep snowbank. Black Lake would have to wait a few more weeks. We continued to ride side roads and trails through the afternoon before retiring to camp for dinner. The next morning, we rode through the town of Bear and on to Council for breakfast. We made quick work of Idaho 52 back to Emmett, and Highway 16 into Star/Eagle/Boise. So there you have it. There is still plenty of snow up in the mountains, but that doesn’t mean you shouldn’t try to get someplace cool over the next few weekends. One thing’s for certain—you’ll have most of the more remote places to yourself as long as nobody thinks the road is passable. 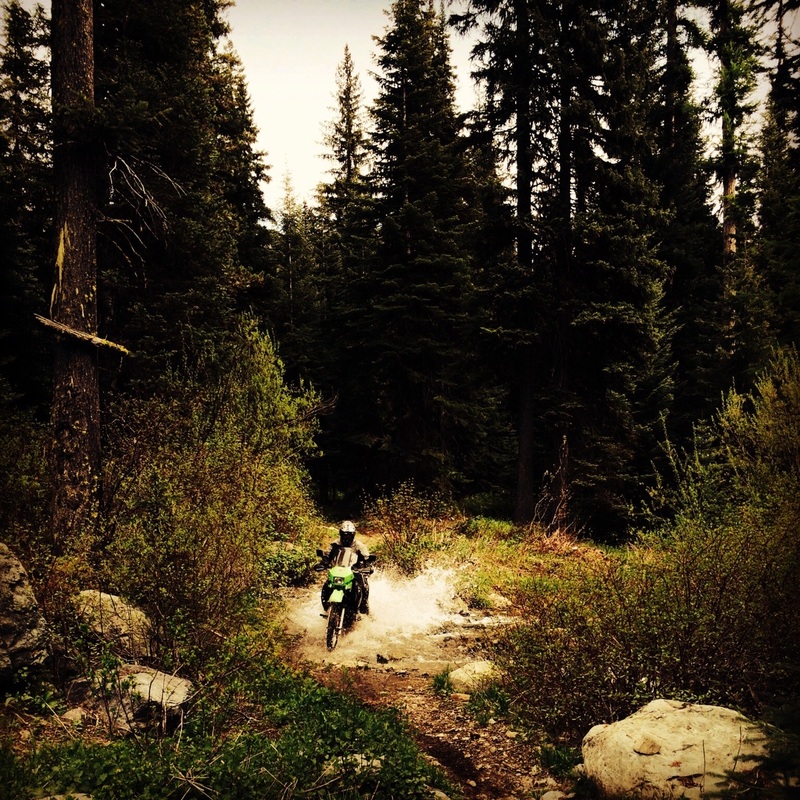 Posted in Places, Transworld TourTagged cuprum, dual sport motorcycle, hells canyon, Kawasaki KLR650, kleinschmidt gradeBookmark the permalink. Hi Andrew…….you had a good ride and no doubt a great time. A small group of us tried to get to Black Lake yesterday and it is still snowed in. They did have some equipment up there trying to open it up. I enjoy your posts. Thanks Bill! Glad to hear you made it up there, and looking forward to getting all the way to Black Lake when the road clears. Do you have any more big (Dakar) rides on the horizon? Actually, I’m working on the Idaho Backcountry Discovery Route with the BDR people. By the end of August, we will have a 1200 mile offroad route from Nevada to Canada. It will be some of the best stuff Idaho has to offer. I rode in Mexico in January, Arizona in April and May and next week in The Cascades of Washington. I guess that we just can’t get enough of this stuff. One of these days, I would buy you lunch…….it would be good to hear of your travels.